A historic mill, which is part of Derbyshire's World Heritage Site, has been badly damaged in a fire. 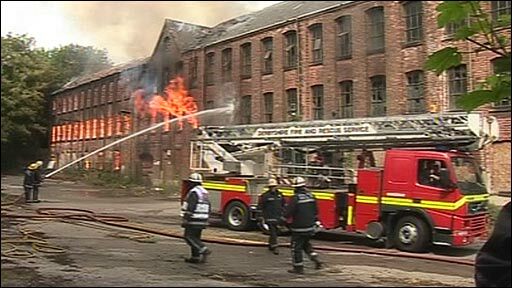 Crews were called to the empty 18th Century Bath Street Mill in Derby after smoke was seen coming from inside. At its height more than 30 firefighters were helping to tackle the blaze and roads in the area were closed. There area no reports of any injuries and crews said that as soon as they can enter the building, an investigation would begin. The Derwent Valley Mills, which stretch for 15 miles along the river, became a World Heritage Site in 2001 in recognition of their role in the Industrial Revolution.